Faerie Festivals take place at crossover points in the seasons. Crossover points are times "in between" when there is a shift in an energy pattern such as Spring and Summer Equinox and Summer and Winter Solstice. The Fey also celebrate the four festivals of Imbolc, Beltane, Lammas and Samhain. The Fey do love a great party! Don't forget to leave them a special treat of food and drink. Imbolc is a time when life begins to stir in the belly of the Earth Mother, a crossover point between the depths of Winter into the beginnings of Light. The Hag or Dark Fairy gives way to the young and radiant Maiden. Faeries like a neat and tidy home so now is a good time to do a good house cleaning and throw out or give away that which is no longer needed in your life. Imbolc Faerie Magick could include lighting candles and placing them in your windows and around your home and asking the Fey Folk to bless your upcoming projects for the year. Pledge a special act of caring for the natural world (the world of the Faeries) in return. Ostara is a very powerful crossover point when day and night are balanced before tipping towards longer days and shorter nights. The Faeries are very busy taking care of all the newly blooming flowers and may be glimpsed in your garden while you work to clear away the winter debris. Ostara Faerie Magick could include planting some special seeds while asking the Fey for help tending them. 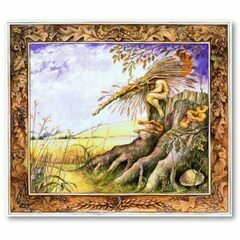 Visualize the Faeries love and care while humming or singing as you plant. Place water in a pottery or glass jug and leave it out in the noon sun. Ask the Faeries to bless it, and imagine them dancing around it and touching it with their glimmering fingers. Use the water to give your houseplants a special spring blessing. 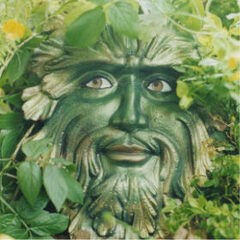 Make contact with the Green Man who is a powerful Nature Spirit by walking alone in the woods. Know that he is watching you; you may catch a glimpse of him behind a tree or in the lacework of budding leaves. Beltane is a crossover point marking the beginning of the Celtic Summer. It is a joyful and sensuous festival filled with flowers and beauty, singing, dancing, feasting and love. Beltane marks a very important transition for the Faerie Folk, it was the time that the Gaelic Celts landed on the shores of Ireland. The last of the magickal people of the Island retreated from the world of humans into the Hollow Hills and became the people of the Sidhe. At Beltane you will find the Faeries dancing and swaying with bluebells in the woods, skipping in sunshine, and happily flitting from flower to flower in your garden. They are not above stealing butter or parts of a ritual fire, and delight in hiding peoples possessions only to have them reappear at unexpected times and places. Beltane Magick could include rising early on May Day and washing your face in the dew to ensure beauty during the coming year. 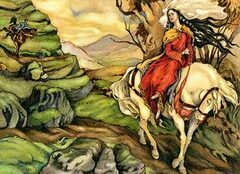 Sit quietly at dusk and listen for the sound of the Faerie Queen Rhiannon riding past on her white horse. You may glimpse the shimmer of her sea blue cloak, and if she touches your heart you will be filled with love and inspiration. Litha is the most magickal crossover point of the year when the sun is at its full strength and stands still at Summer Solstice before beginning to recede as we move into the waning half of the year. The Faerie Folk are very active, playing pranks and even stealing away the young and beautiful to join them in the Hollow Hills. Litha Magick could include picking St. John’s Wort to break any unwanted Faerie enchantment and drive away depressing. If you pick St. John’s Wort on Midsummer’s Day and carry it, you will remain cheerful, or if you wish to become pregnant pick it while walking naked in the garden. Look for water nymphs or the Lady of the Lake herself rising from the luminous depths. Allow yourself to open to your unconscious and let yourself be transformed. Lammas or Lughnasadh is the festival of Lugh the Celtic Lord of the Tuatha de Danann whose name means “Bright One”. Lammas is a major Faerie Festival when the Fey folk begin to prepare for the long winter ahead. Processions of them may be seen as a line of twinkling lights moving about the countryside. At Lammas there is an underlying theme of death, the Corn Spirit must be sacrificed in order to reap the harvest. If you walk in fields of ripe wheat you may feel the anger of the nature spirits at what shall be taken from the earth. Lammas Magick may include gathering up some ears of wheat, tying them in a bunch with red thread to make a winter charm to hang over your hearth. Pledge an act of caring for the earth as an offering for what you take from it. Bake bread and use the rising of the dough as a spell to ensure prosperity. As you knead the dough say “As this dough swells, so may my fortunes increase.” Don’t forget to leave some of the breadcrumbs outside for the Faeries. At Mabon we are poised between Light and Dark, caught in a moment of perfect balance before the scales tip towards the darkness of winter. The veil between the worlds begins to thin, and it is easier for the spirit world to visit us. It is a time of industry and putting aside the fruits of the harvest. Canning, freezing, drying and gathering are all Mabon activities. The weather is beginning to change, some days are sun-kissed and warm, while on other days ground mist forms in the morning, and the weather is damp and chill. The blackberry is a most magickal faerie plant, but beware of picking the berries after the end of September, lest you incur the faeries wrath. Leave a piece of blackberry pie for the Fey folk to enjoy and they will bless you. If you can find a blackberry bush that forms an arch and faces east/west, crawl through it three times on a sunny day to be healed of physical ills. 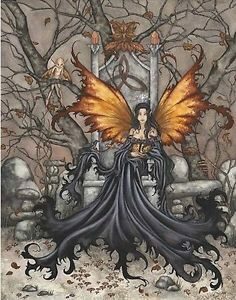 The Autumn Equinox is a time to honor the Faery Queen, Mab, who is the Goddess in her guise as wise-woman and Lady of Magick. 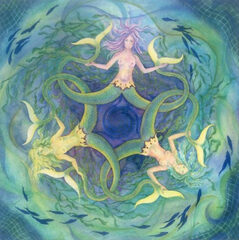 She will bring you dreams and visions, and will encourage you to take back your own personal power. Toast Mab outdoors at the Full Moon closest to Mabon with a chalice of wine. Raise your glass to her, drink some wine, then pour the rest on the ground as an offering.